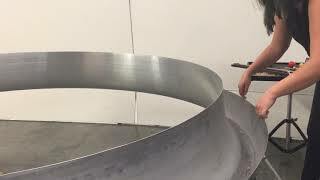 Originally sourced and used for John Bergamo’s piece, “On the Edge,” this large cowling was from a 747 jet engine and was at CalArts for many years. It can be used for multiple effects, including for striking, bowing, and rolling objects through the well. It measures 100” on the outside diameter and 84” on the inside. Just a few options for sounds from the jet engine cowling.